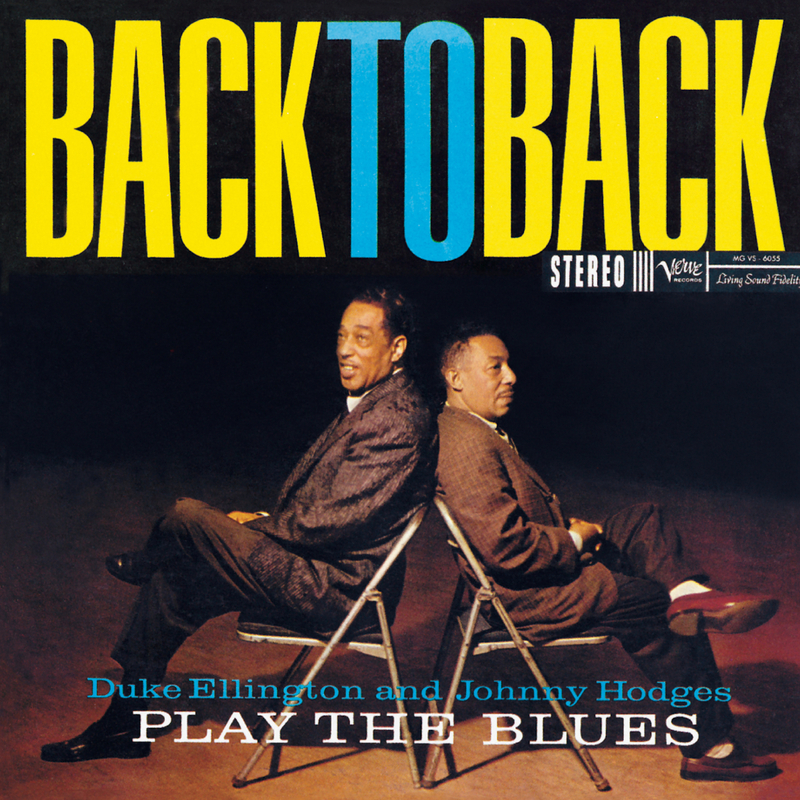 Back to back, or side by side, Duke Ellington and Johnny Hodges form a duo which, in terms of sustained jazz artistry, has never been rivaled. The Ellington fanciers will be well rewarded, for there are many passages of Duke’s unusual and charming solo improvisations. 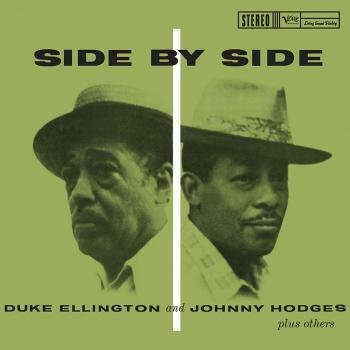 “Johnny Hodges,” Duke said, “has complete independence of expression. He says what he wants to say on the horn, and that is it. He says it in his language, from his perspective, which is specific, and you could say that his is pure artistry.” Hodges carries most of the melodic statements of well-known blues standards, but gets in his share of ad lib choruses along with the swinging trumpet of Harry “Sweets” Edison. This is one of the most thoroughly relaxed, conversational jazz sessions ever recorded. In one sense or another, Johnny Hodges was always on his own — even on the Ellington bandstand, where he began and became best known. He joined Ellington early in life, at twenty in 1928, and he died a member of the Duke Ellington Orchestra, suffering a heart attack in a dentist’s chair shortly after recording part of his lifelong boss’s New Orleans Suite in 1970. As a result, his sound, or his two principal sounds — the lusty warmth of his ballad readings and the offhand lilt of his uptempo improvisations — are inevitably associated with Ellington. Yet Hodges’s voice came entirely from within; as Ellington put it, he "is a consummate original." Indeed, Hodges is now widely acknowledged as one of the most individualistic interpretive voices in all jazz. As a solo artist away from Ellington, Hodges had three mini-careers during his tenure with Norman Granz and the labels he launched: independent bandleader, after he resigned from the Ellington organization, 1951–55; soloist, mostly leading ensembles of Ellington orchestra members after he reunited with Duke, from 1956–61; and would-be jazz-pop star, working with the hit-oriented producer Creed Taylor, 1961–70. The child of loving and relatively well-to-do African-American parents, Edward Kennedy "Duke" Ellington was born on April 29, 1899, in Washington, D.C. — not only the capital of the United States but, at that time, home to the largest and best-educated black population in the country. As he became a teenaged bandleader, he learned to appreciate the unique aspects of every musician in his group, and he was later able to reconcile these differences and utilize them in an innovative and completely democratic way. He inspired confidence in his musicians. After building a successful dance band business in Washington, he moved to New York City in 1923. The Duke cultivated exotic sounds in his orchestra: an emphasis on contrast between the low- and high-pitched instruments, a prominent use of minor keys and blues tonalities, a style he called jungle music, and unusual effects drawn out or encouraged from his instrumentalists and vocalists. By the late 1920s, Ellington’s musicians had all developed into distinctive soloists. Among the great players who worked with Ellington over the years were saxophonists Johnny Hodges, Harry Carney, and Ben Webster; clarinetists Barney Bigard and Jimmy Hamilton; trumpeters Bubber Miley, Cootie Williams, Rex Stewart, and Ray Nance; trombonists Joe "Tricky Sam" Nanton and Lawrence Brown; bassist Jimmy Blanton; and drummer Sam Woodyard. That array of talent remains awe-inspiring and will continue to influence future generations of jazz musicians. The maestro also easily participated with, and challenged, such younger innovators of the 1960s as bassist Charles Mingus and saxophonist John Coltrane. Perhaps more consequential was "Mood Indigo" which became one of the first pieces written by a jazz composer to be accepted by the public as a popular song. From this point on, Ellington developed into a major contributor to the American popular-song repertoire, writing such other hit tunes as "In a Sentimental Mood," "Prelude to a Kiss," "Sophisticated Lady," "Solitude," and "Satin Doll." However, the piece most people associate with Duke Ellington, "Take the ‘A’ Train," was written by pianist-composer Billy Strayhorn, who joined Ellington in 1939 and became his closest associate. Saddened but not defeated by Strayhorn’s death in 1967, the Duke continued to compose, play, and tour with his world-famous orchestra until his own death on May 24, 1974.